And here we see our Fearsome Foursome finally reunited. Seems that Snuka and the Professor simply hailed a cab after the slight irregularity with the Professormobile’s navigation system/atomic batteries. Probably that would have been the most sensible thing to do from the very start, but the Superhero Code demands that you at least try to do things in style. Snuka is really not giving up those feature-laden gloves lightly, but he felt that the gayest costume on Earth could cause more turbulences in his dating life than his puberty-stricken self-esteem could handle. He has had a steep learning curve in that regard after moving to the states, beginning with the first t-shirt he bought. He thought it was just some pretty rainbow. 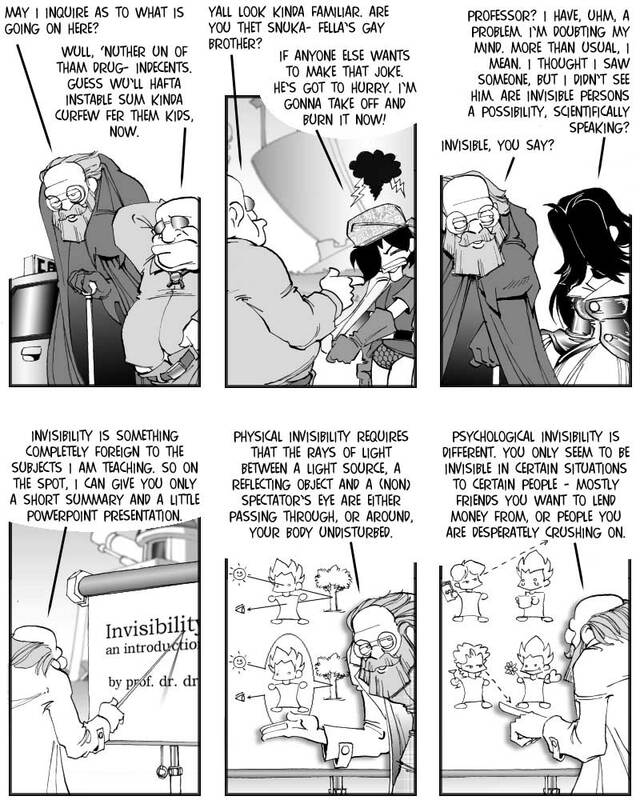 The invisibility cloak recently proposed by researchers in England and the United States would work not unlike the 2nd principle discussed (and depicted) in panel five, by the way – so you see, I’m giving you solid pseudo-science here. More on Invisiblity and the Modern Killer on Monday. Please vote. P.S. : When Snuka says he is going to take off his clothes now, of course he doesn’t mean: “Righ now, right here, in front of all you people.” Sheesh, get your mind out of the gutter. 😛 And anyway, exhibitionism isn’t a hobby you should really indulge in while the vigilant eye of the law is resting upon you. Unless they are up for it.